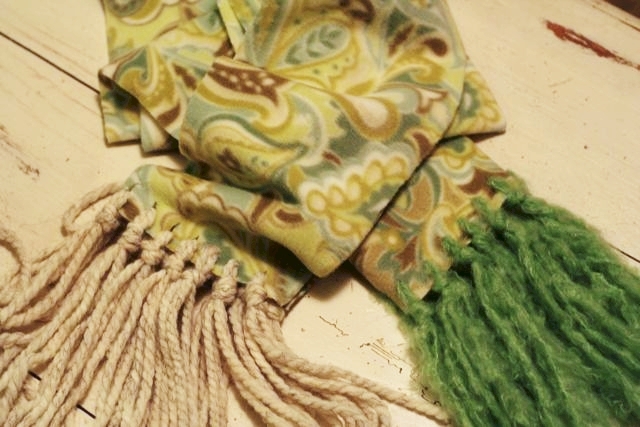 I saw a lady wearing this colorful scarf this last Sunday and inquired about it. She explained how her sister had made it for her, and as I often do, I grabbed it and had myself a look, thinking about the possibilities of making one myself. So when my daughter came home and told me she needed some material for her Home Ec class I got excited. Of course I was thinking of ways to use what I already had but I was fresh out of fleece. So off to Jo-Ann Fabric we went. 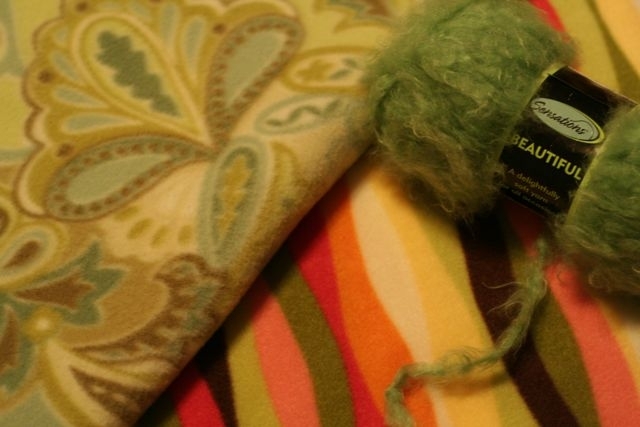 I only bought a half yard of two different fleece designs and yarn for the fringe. I was excited to get started. This is such an easy project, I think with supervision, kids could even make these. 1. 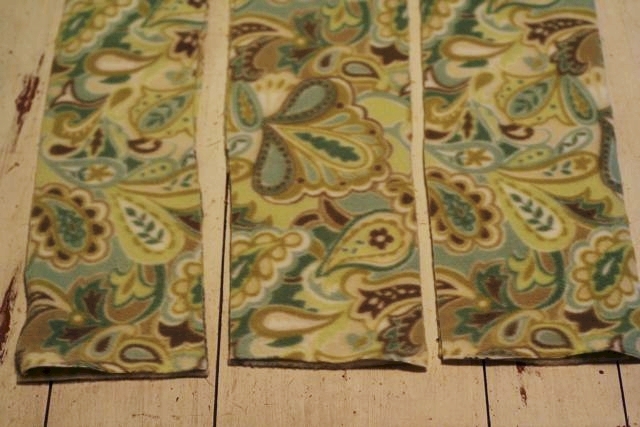 Cut the fleece into 3 equal pieces. Mine are not perfect. 2. 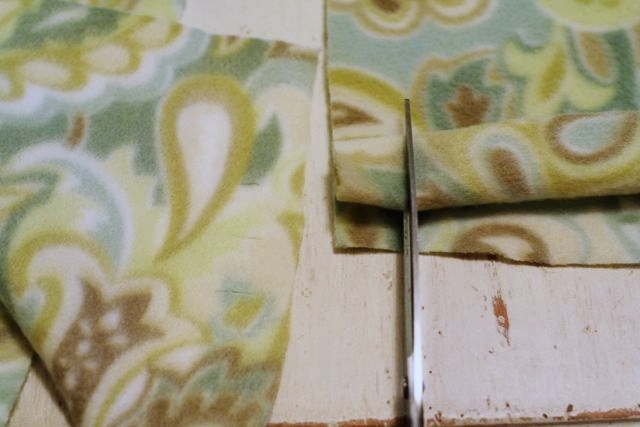 Fold over the fleece and cut seven 1/8" slits in the fleece evenly across. Be very careful not to cut too big of slits, I did this with my first one. 3. 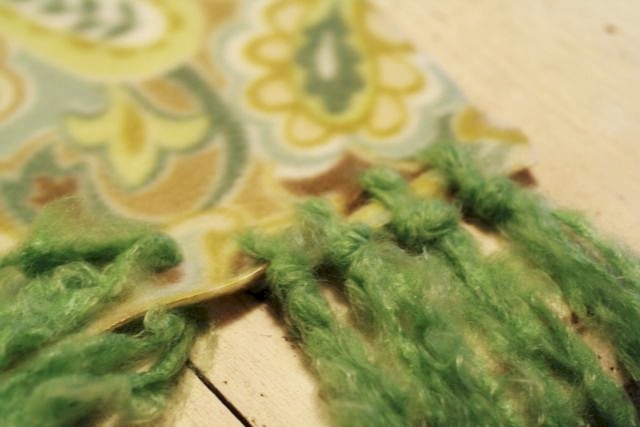 Pull the yarn through the holes, you may need to use a knitting tool to help. 4. 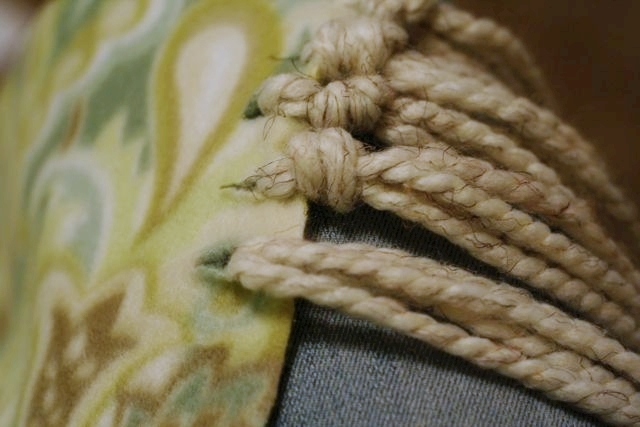 After you pull your yarn through, tie the yarn in a knot up near the fleece. 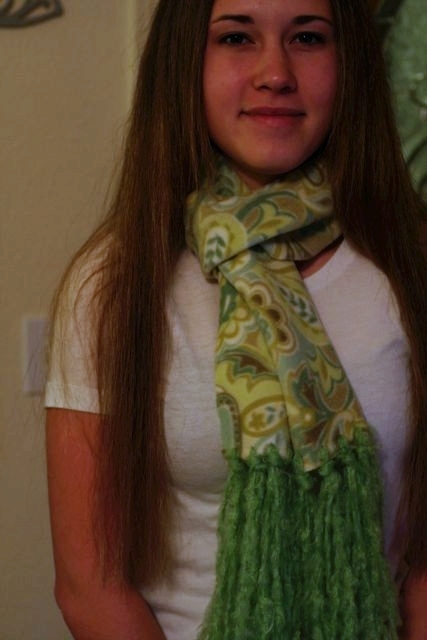 My lovely daughter modeling the scarf. And please as always if you come up with a better way to do this, let me know, I love to hear new ideas and easier ways to do things. This entry was posted in DIY, Holidays, I made this!, tutorial on December 1, 2009 by Deanna. Very nice! I like! I will be attempting to make another type of super simple sew-free scarf this week and, if all works out, will be posting about it soon. That scarf was nice and warm. I love it!! Great idea!! Looks fabulous. I want to make some of these now. This is a great way to use up some of those yarn scraps that we knitters and crocheters seem to always have! This would even look great with muli-colored fringe, tailored to the tastes of the recipient and matched (or purposely clashing) with the colors of the fleece. I love this idea I well be making this for my Xmas gifts.Thank you.